Mark Alnutt faces his first major hire as the University at Buffalo’s athletic director. 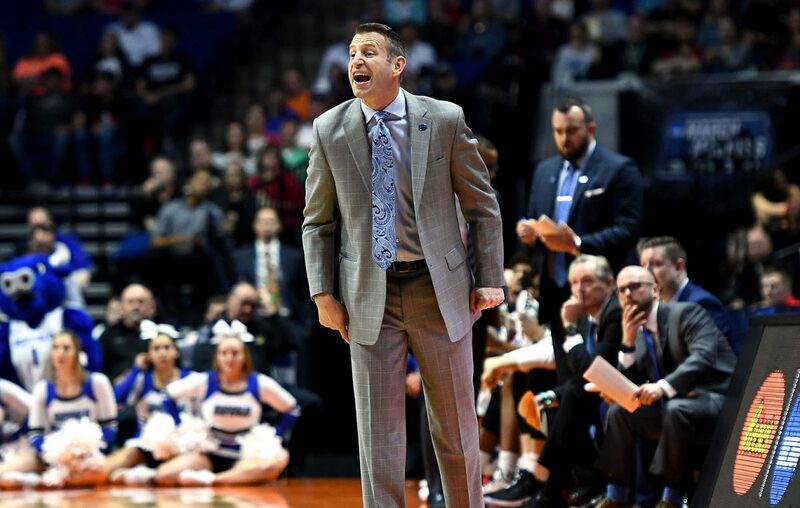 Nate Oats became Alabama's men's basketball coach Wednesday, and Oats' departure creates a gaping hole in the athletic program – a hole that needs to be filled smartly and swiftly. Alnutt came from Memphis, and walked into a good situation at UB in March 2018. The men’s and women’s basketball teams had made NCAA Tournament appearances, and the football team was on the verge of a record-setting season. Now, Alnutt faces a decision: He has to make a hire that likely will define his tenure at UB as athletic director. The next coach has to win, and has to keep the men's basketball program on the pedestal of being one of UB's consistently successful athletic teams. UB cannot afford to hire a coach who could drive the program into the ground, and unravel what Oats and Bobby Hurley built over six seasons. Following his introductory news conference in Tuscaloosa, Ala., Oats said he expected UB to announce his replacement in about a week and a half. What could complicate Alnutt’s task is the fact that he could lose another coach from a marquee UB team to a Power Five school, and face the possibility of having to fill two high-profile positions. Women’s basketball coach Felisha Legette-Jack recently completed her seventh season at UB, and could parlay back-to-back NCAA Tournament appearances into a coaching job at a Power Five program. Among the more enticing openings across the nation are Penn State of the Big Ten, Georgia Tech of the ACC and Tennessee of the SEC. But when it comes solely to focusing on the men’s program, how high does Alnutt want to aim? Does he want someone with previous Division I head-coaching experience? Or does he want a coach from another mid-major program to continue to cultivate the Bulls as one of the nation's best mid-major programs and a perennial Mid-American Conference power? Or will Alnutt shift gears, and instead pursue some of the best recruiters at Power Five programs? Several potential candidates from various college coaching backgrounds could become UB's next men's basketball coach. Dane Fife, Michigan State: Fife played for Bobby Knight at Indiana and is Tom Izzo’s top assistant with the Spartans. He’s also lauded for being a high-level recruiter, and was head coach for six seasons at Indiana-Purdue-Fort Wayne. But the question is if he will leave Izzo’s camp. Chris Caputo, Miami (Fla.): Caputo is a high-level recruiter, and a veteran assistant coach who has worked with highly respected Hurricanes coach Jim Larranaga for 17 seasons at Miami and at George Mason, where he helped Larranaga coach the Patriots to the Final Four in 2006. Carlin Hartman, Oklahoma: Hartman is an assistant under Lon Kruger, and a Grand Island native who is an experienced assistant, a strong recruiter and as a coach, focuses on developing inside players and big men. Rob Lanier, Tennessee: Lainer, a former St. Bonaventure player and a Buffalo native, was fired from Siena in 2005 but has built his coaching resume as an assistant at Virginia and Florida, and on Rick Barnes’ staffs at Texas, and Tennessee for the last eight seasons. He’s a cousin of former Bona standout Bob Lanier. John Becker, Vermont: Becker has led the Catamounts to three NCAA Tournaments, three America East tournament championships and two NIT berths since he took over the program in 2011. He’s also averaged 24 wins a season as a coach. Jim Whitesell, UB assistant: Whitesell was an assistant to Oats for four seasons, and is currently UB’s interim coach. He is regarded as a great strategist who also has previous experience as a head coach at the Division I, II and III levels from 1987 to 2011, including seven seasons at Loyola-Chicago. Whitesell’s only downside is that he is not a high-level recruiter. Bryan Hodgson, UB assistant: Hodgson is UB’s secret weapon when it comes to recruiting, as he’s brought several of the current players into the program, including Dontay Caruthers and Jeremy Harris. He also has cultivated strong connections in the junior-college ranks but has no head coaching experience.